Now I realize this sounds terribly pietistic, and the more theological astute might respond with a cogent, “Duh!” But the reality is “in Him we live and move and have our being (Acts 17:28).” Christ is the center of all things, for “all things were created by Him, and for Him and through Him (Col 1:16-17).” Thus, despite what you may have assumed, your marriage is NOT primarily about living out some romantic fantasy, but glorifying God. To make your marriage truly Christian, you, have to be committed first, foremost and always, to being God’s man or woman, centered always on Christ. Now, but what does all that mean, in real-life terms? First, to be centered on Christ means submitted to Christ. Jesus said, “If you love me, keep my commands,” (Jn 14:15). Your views, expectations, assumptions, values and behaviors must be re-oriented to the Scriptures. This may not sound like rocket science, but at the root of many Christian marriage problems are unstated assumptions that are unbiblical, and unprofitable. Remember, Adam already had a perfect relationship with God, before he was given Eve. True, he was not created to be a solitary individual, “it is not good for the man to be alone (Gen 2:18).” But still, he already had a perfect relationship with God before marriage. Perhaps the most common false assumption is that somehow, marriage will fill a void or vacuum in us. Many young Christians enter marriage with the idea that they have needs that will be fulfilled by the other person. Thus, whether they realize it or not, they have a selfish orientation that then colors every other aspect of their relationship. This inevitably leads to frustration, conflict, confrontation, unfulfilled expectations and bitterness. But Christ Himself set the standard when He said, “For even the Son of Man did not come to be served, but to serve and give His life a ransom for many (Mark 10:45).” A solid Christian marriage is based not on seeking to have our needs met, but rather in being committed to meeting our spouses’ needs. A husband takes a wife, and vows before God to protect, nurture and sanctify his bride (Eph 5:22ff). A woman takes a husband and vows to “love, honor and obey” her husband, trusting in that man, respecting him and submitting to his leadership (1 Peter 3:1). 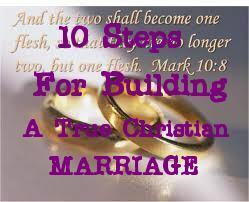 The only way you can fulfill your duties towards your spouse is if you are fully committed to obeying Christ. Remember, love in Scripture is never defined as a feeling, but as a commitment to do what is right and proper for another, regardless of the personal cost. That is what makes a Christian marriage, Christian. How do you keep Christ at the center and maintain this kind of focus? One way is through consistent, daily, family-worship. As opposed to some dead, dry ritual, family worship requires husbands to take personal responsibility for teaching their wives (and children when they come along). Every day that he opens that Bible, reads the Scriptures to his wife, and teaches her God’s commands; he is forging a new link in their relationship. As they pray together, confess their sins to one another, and then encourage each other to apply what they are learning together, it keeps their priorities straight, puts their petty squabbles into perspective, and fuels their own intimacy and affection. Family worship is NOT just something “nice” Christians should do, but the very lifeline of their faith, their relationship with God, and each other. The nature of God is unity in diversity; there is one God in three distinct persons. Each person has all the attributes of God, all the power of God, all the glory of God, yet they have mutually distinct roles within the Godhead. All of creation was intended to display God’s glory but nowhere is this remarkable aspect of God’s nature more clearly seen then in Christian marriage. The relationship between husband and wife is a picture of the Trinity where there is equality of honor (1 Peter 3:7), but distinction of function. The old women of both sexes who attack male headship never seem to understand that Biblical marriage works, because it is based on the unchanging nature of God Himself. Husbands must love their wives “as Christ loved the church and gave Himself up for her.” And wives must submit and respect their husbands. Understanding and working out the implications of this fundamental theological truth is the basis for any successful marriage. The Christian husband is not a tyrant, lording it over his family as if he were some sort of oriental potentate and she no more than either a pretty decoration, or a child-making machine. Instead, He represents the Sovereign God of Creation, and is granted true authority, to which both wife and children are bound to honor and respect. And as the head of his house, his duty is to protect his family, to care for them, if necessary even to die for them, just as Christ died for His bride, the church. Furthermore, the husband is given a divine responsibility to sanctify his wife (as well as bring his children up in the “discipline and admonition of the Lord,” Eph 6:2ff). When he takes her as a bride, he is vowing before God to work every day for the rest of his life to present her to God perfect,“having no spot or wrinkle, but that she should be holy and blameless” (Eph 5:27). And her vow is that she will submit to Him, as the church submits to Christ. She will honor him, respect him, and yes, obey him as she would respect and obey God. She willingly lays aside her own goals and dreams, just as Christ laid aside His own glory (Jn 17:5), and becomes “one flesh” with her husband, helping him in his dominion calling (Gen 2:16). And the husband grants her honor, as a fellow heir of salvation (1 Peter 3:7), and treasures her (Proverbs 31:1) and exalts her (Proverbs 31:28-29). Thus, when husband and wife share equality of honor, yet distinction of function, they are then freed to minister to each other, and the world. The honor of God’s name is in many respects, reflected in your life (Romans 2:24). Since we were created in His image, and Christ has restored the damage done to that image by sin, Christians represent the name of God to the rest of creation. As we noted above, Christian marriage is a picture of the triune nature of God. Thus your marriage, whether you realize it or not, is intended to reveal something of God’s nature to the world. And when Christians realize their marriage is a witness to the world of the glory of God in the most fundamental aspect of His nature, and when they strive to uphold that image by fulfilling their covenant obligations to one another, they glorify God and receive all the blessings He promised. Therefore, your marriage will work, only when it is firmly grounded in its true purpose; reflecting the glory and image of God. You have a divine duty to fulfill your covenant duties towards your spouse because in doing so, you are demonstrating your true submission to King Jesus. Let us be clear here, most modern evangelicals believe that romantic love is the foundation of a successful marriage, and hence when they “fall out” of love, believe they have justification for seeking a new partner. This myth of romantic infatuation as the basis for marriage is so deeply ingrained in our thinking, that even to suggest it might be deficient garners howls of outrage in some quarters. In our modern culture, we have lost the idea of commitment that transcends the vagrancies of our emotions. Christians today assume that life is to be lived on feelings, rather than on commitment to principles and ideals. And so, we suffer the highest divorce rate in history. However, there is another way to live; according to the eternal, unchanging standards of God’s Law. This is true, Biblical Christianity and the sort that allowed our ancestors to enter the arenas of the Roman Empire singing songs of praise to Almighty God, even while wild animals tore them to pieces. Our fathers in the Faith, won the Empire, survived the Dark Ages, built Medieval Christian Civilization, Reformed the Church, and settled new continents for Christ, were not victims of their emotions. They were willing to sacrifice all because they BELIEVED God and were submitted to His Law. And they bore the name of God before the nations. Your marriage therefore must be based on a mutual submission to the principles, statutes, and commandments of God, motivated by the confident assurance that in so doing, you are bearing witness to the grace, mercy and nature of God. This kind of conviction builds marriages that stand the test of time. This commitment to doing what is right, regardless of your feelings allows you to overlook each other’s faults and frailties, to meet each others’ needs regardless of your feelings, and build a true, lasting relationship that only grows stronger, and closer over the years. Marriages are not lived in isolation. The people with whom you regularly associate will have a great influence on your values, opinions and practices. “Do not be deceived; bad company corrupts good morals” (1 Cor 15:33). Therefore, you need to belong to a covenant community where Biblical standards are taught, encouraged and reinforced by those around you. If your church family ridicules men and encourages shrewish, domineering women, then you WILL become like them. For either good, or bad, the company you keep will influence you (1 Cor 11:1, Phil 4:8). Therefore, if you want your marriage to work, to prosper, to be a blessing to yourself, each other and your children, find a church where God’s Law is honored, discussed and APPLIED. In fact, let me go one step further, if there is no such church in your area, then move your family across the country if necessary but find a church where men are encouraged to be godly MEN, taking leadership in the home, giving their wives self-sacrificial love. Find a church where the women genuinely respect their husbands, and are content in being helpmates. After all my friend, on the great and glorious Day of Judgment, God will not be terribly impressed by your investment portfolio, or how many new cars you owned, or even by the number of toys you accumulated. But He will be mighty interested in how well a man worked to sanctify his wife (Eph 4:22ff). Modern pagans, and sadly many Christians, see children as at best an experience and at worse a nuisance. Many Christian books on marriage do not even deal with the central role that your children play in God’s Kingdom. Marriage is now about two autonomous individuals getting together because they believe that the other person holds the key to their personal fulfillment and happiness. In this view, children may, or may not enter into the picture depending upon the personal desires of the couple. On the other hand, the Bible sees things differently. The first command to Adam and Eve was “be fruitful and multiply.” As a direct consequence, you have a divine duty to bear and raise a godly seed for the future (in so far as God gives grace). Your children are the means by which God intends you to exercise dominion over His world (Gen 1:28). Therefore bearing children, raising children, training children, and equipping them for dominion is one of the primary ways that God uses to subdue the earth for His glory (the other of course, being evangelism cf., Matt 28:19-20). Granted, one day they will grow up, get married and start their own families, but even so, your task is not yet done. For then you need to help them train your grandchildren, provide them an inheritance, and thus, generation by generation extend the rule of the godly over every area of life. No man, no matter how gifted or blessed by God, can accomplish all that needs to be done in one lifetime. Hence, your children are your “arrows” into the future (Psa 127:4ff) wherein you continue to exercise dominion. This orientation motivates you, protects you, and gives your marriage a purpose beyond just personal fulfillment. Couples who are committed to this principle can weather even the toughest situations, because they live not just for themselves, but for generations yet unborn. Look, let us be honest; you will sin against one another. You are not perfected yet, and at times, you will be selfish, inconsiderate, irritable and not easy to get along with. Husbands will not always self-sacrificially love their wives as Christ loved the church, and women will not always respect and submit to their husbands. Sometimes you will nag at each other, yell at each other, fail in your covenant duties towards one another. So, therefore, learn how to deal with those sins properly and wisely, not holding bitterness and anger towards one another. In twenty years of marriage counseling, almost every single time when Christians come for help, no matter WHAT the presentation problem was, a little data gathering revealed a consistent pattern of both partners sinning against each other, and then not forgiving each other. In many cases, the problem that finally drove them to see me (before seeing their lawyer) was caused by a lack of forgiveness from some previous sin never dealt with. The Scriptures say, “Do not let the sun go down on your anger (Eph 4:26).” Therefore, when you sin against each other (and you will) then confess that sin, repent of it to the other person, and ask for forgiveness THAT DAY. Never, ever, go to bed angry, frustrated or upset with your spouse. Maybe the problem itself cannot be resolved that day, but at least you can ask for, and grant forgiveness for any sins so that tomorrow, you start with a clean slate and TOGETHER, you can begin working on the problem. If you let sins build up, you will become bitter; life will become one constant lemon that ruins every aspect of your life (Hebrews 12:15). Instead, realistically understand that you will sin against each other; therefore learn how to ask for, and give forgiveness to one another. Remember, you are “one flesh.” Being embittered against each other makes as much sense as hating your arm or leg. And a couple that has not learned how to practice forgiveness on a daily basis is doomed to hatred, bitterness and judgment. Remember when we just talked about the central role that children play in the family? Well, God thought this was SO important, that he gave us both one of the most power drives imaginable, as well as the most pleasurable thing on earth to keep us motivated. Sadly, like every other blessing God give us, we manage to pervert and distort it. But even our sin does not change the fact that God intended us to enjoy (yes ENJOY) a vigorous, and healthy sexual life. God thought sexual love within marriage to be so important; He inspired an entire book dedicated to it! Your bodies are not your own, and Paul says you have a divine duty to one another sexually (1 Cor 7:1ff). Not only does this keep you pure from temptation, but also builds your own intimacy with one another. Therefore, love your spouse, and be satisfied with them, seeking to please them; and have fun, often! #8 Do not let friends, hobbies, work, etc., steal you from your spouse. Remember, that in Christian marriage, you are “one flesh:” each one belongs to the other, and that certainly includes time and attention. Since time is limited, when you do one thing, you cannot do another. When you act selfishly by allowing your time and attention to be distracted by work, hobbies, or even church activities, you are in effect stealing them from your spouse. As we have mentioned several times, you are under a divine obligation to your partner. Make sure, you are committed to them; and then only to other things as you have time and opportunity. Another consequence of being “one flesh” is that you must develop true, emotional and intellectual intimacy with your spouse. They are your best friend, and the one person you ought to be able to count on regardless of the situation. Therefore, you must never lie to them, but always “speak the truth in love” (Eph 4: 25). If there are things you can talk about with others, but not your spouse, you have a real problem. Thus, men especially need to learn how to communicate with their wives. With exceptions noted, women tend to desire more frequent displays of affection and intimacy than men. Therefore, men MUST learn how to TALK with their wives. Now, I am not recommending feminizing men as some have done; gender roles and differences are a part of the creation. But I am saying that godly men, as a part of their duty to sanctify their wives, will learn how to communicate in ways that minister to their needs. And conversely, women must learn how to stop nagging their husbands just because he does not want to “open up” and cry, like a baby. Each must learn how the other communicates, and then seek what is best for their partner, convinced that God will meet their own needs, as they seek to meet each other’s. #10 Learn to be satisfied and content with the spouse God has given you. Do not let the world, the media, etc., give you unrealistic expectations of marriage (either sexual, emotional, physical, etc.,). We are bombarded with so many false expectations that we can become easily dissatisfied with what God has given us, because the grass looks oh, so much greener over the neighbor’s fence. Solomon says, “Rejoice in the wife of your youth, let her breasts satisfy you at all times, be exhilarated always with her love (Proverbs 5:19);” and that means, “do not compare her with other women,” or even with what she looked like twenty years ago. Instead, learn how to be committed and content with the person you married, and work on fulfilling your covenant obligations to them. Yes, even the godliest of men can find their eye wandering, but acknowledge it for what it is, and repent. Instead, focus on loving THIS person, being committed to their spiritual, emotional and physical well-being. Do not covet what is not yours. Marriage is only for this life; there will be no marriage or giving in marriage in the eternal state, for God will have brought all of His Elect into existence by then. But in THIS life, marriage is one of the primary means we have of reflecting God’s image, and subduing His creation to His glory. Therefore, it really does matter what kind of marriage you build; it says something about what kind of Christian you really are. For most of us, the cutting edge of discipleship will not entail going to the mission field, or dying a martyr’s death. Just love your wife, as Christ loved the church. Respect your husband as you would respect Jesus Himself. Bring up your children in the discipline and admonition of the Lord. And if we learn how to conduct our marriages, and govern our families, in time, God will give us the world. This article to me is truly God sent!!!!!!!! !I've been praying for days for such a good Biblical lesson on how to work my marriage in Christ since i have been sooo attached to the Lord being new to our Lord i felt distant against my husband did not know how to share my love for Christ with him and i have been constantly praying about that. You guys blessed me for letting God use you this way to reach out to my issue. May God keep you in His love and in His eternal company till the end as well as the joy He'll give you all each day in our precious Lord Jesus' Name. Amen! You say that men must teach women, but that is not even Biblically supported. The church at Philippi (Book of Philippians) was led by women and God told Paul to support those women in that leadership role. There are tons of other examples of females in teaching and leadership roles in the old and new testament including women who were with Jesus. You have some good points, but you are selling all women short with this list and that is sad because when I read my Bible, I see how much God expects women to lead and celebrates his daughters. This is talking about men's and women's roles in marriage and in marriage, men are commanded to teach their wives. I couldn't find a Biblical basis for women running the church in Philippi, could you show me where you got that? Thank you my Lord, I'm about to marry soon. And now I know how to build my marriage and to keep my family with God. May God give you strength and keep going in the mighty name of Jesus Christ our savior Amen. I was reading this article and I found most of it very good. However I'm just a little curious about the part where you said how women should give up all their dreams and goals and just focus on their husbands. Can't they both work together to love, help and encourage each other to meet their goals and dreams? Wouldn't the other way set the marriage up for bitterness instead of harmony. Shouldn't the husband care about the wife's dreams and goals too?